Ice Skating Season Isn’t Over Yet! With the recent snow and minus temperatures, it’s clear that ice skating season isn’t over. There’s no better time to embrace the great outdoors and get your skates on! At a great 600m2, the ice rink in the Presqu’île will be Lyon’s biggest outdoor ice rink. 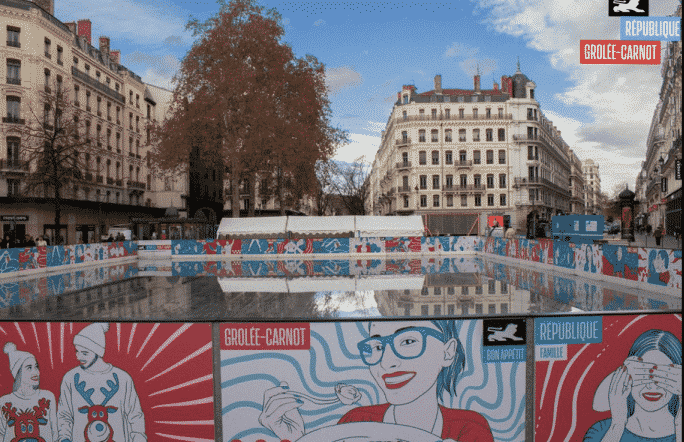 Lyon’s outdoor ice rink will be open until 2nd March 2019. Photo credit – screenshot from République Grolée-Carnot Facebook page. At the weekends, it will be free to watch demonstration by Lyon’s Lions, and these are often followed by ‘Afterworks’, such as musical shows. The public will get the unique opportunity to meet professional ice skaters, including Lyon’s Lions, the synchronised ice skating team, Les Zoulous, and the youth sections of Lyon’s Hockey Club. Four days a week, the ice rink will give local children aged between 6 and 12 years old an initiation into ice hockey, thanks to the programme LHC Ice Community. The children will learn all about the sport: its rules and its collectivity. More than 1000 Lyonnais children will benefit from the initiative. Tickets into the ice rink will be free to all (starting from 4 years old) on the 14th February. All information is available on www.republique-grolee-carnot.com. Tickets are also very reasonably priced on other days, at 4€ entrance, including rental of ice skates. The ice rink will be open to the public on Mondays, Tuesdays, Thursdays, and Fridays from 12pm-2pm and 5pm-7pm, as well as Wednesdays from 12pm-8pm, and weekends at 10am-8pm. There will be different opening times for the February school holidays: on weekdays from 10am-8pm and during the weekend from 10am-8pm.